The William O. Lipinski Symposium on Transportation Policy & Strategy is a working conference that explores transportation and infrastructure problems facing the nation today and discusses new ways to plan, manage, and finance solutions for the 21st century. The Symposium acts as a forum to connect decision-makers with transportation experts from all over the country and to build a consensus on policies for state and federal action now and in the future. By bringing together an impressive group of national and regional policy leaders and technical experts to explore, discuss, and learn together, the Symposium aims to showcase a variety of perspectives and move towards a better understanding of transportation policies and laws. William Oliver Lipinski (D-IL) served on the Transportation Committee. William "Bill" Lipinski was born in Chicago and educated at Loras College in Dubuque, Iowa. He served in the U.S. Army Reserve, as a public administrator with the Chicago Park District, and as the Democratic committeeman for Chicago's 23rd Ward. In 1975, Lipinski was elected to the Chicago City Council as the alderman for the 23rd Ward. Seven years later, he was elected U.S. Representative for Illinois's 5th Congressional district. He represented the 5th and, later, the 3rd Congressional districts from 1983 until his retirement in 2005. During his tenure, Rep. Lipinski served on the U.S. House Committee on Transportation and Infrastructure and had a lifelong passion for transportation-related fields. 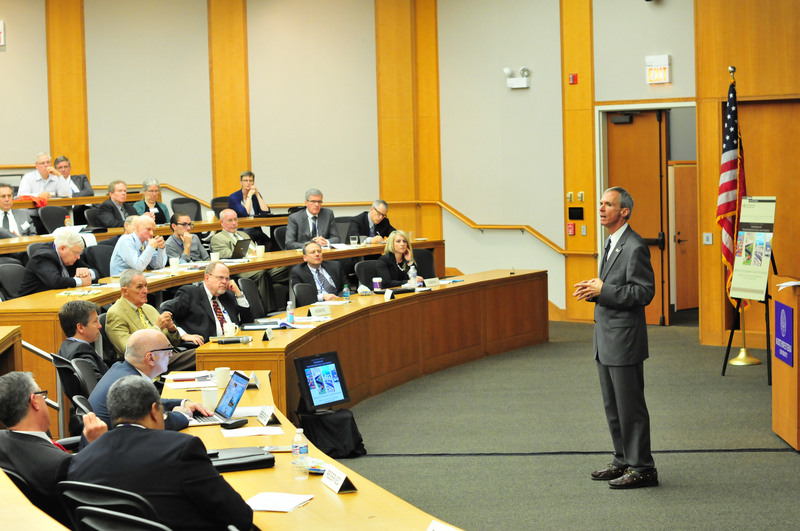 The 2015 Lipinski Symposium explored the role of intermodal supply chain operations for promoting economic development and competitiveness in the Chicago hub, for the purpose of identifying values, obstacles, opportunities, and priorities for advancing freight mobility in the region and the nation. Amid this US transportation and infrastructure crisis, the daylong Lipinski Symposium, hosted by the Northwestern University Transportation Center, offered varied perspectives and promoted a solutions mindset for transportation and infrastructure improvements, exploring issues such as tolling, user fees, and public-private partnerships as a means for the both the nation and the Chicago region to remain economically competitive on a global scale. Hundreds of elected officials, business leaders, transit advocates, and students gathered at this year’s Lipinski Symposium, “Private Money for Public Infrastructure: Promises, Pitfalls, and the Path Forward.” The event — named for former Rep. William O. Lipinski of Chicago, who hosted the conference — was organized by the Northwestern University Transportation Center at the James L. Allen Center, 2169 Campus Drive, in Evanston. Sessions delved into the workings of public-private partnerships. In a session on case studies, leaders shared their experiences bringing to fruition three different and successful public-private partnerships: the Denver Regional Transportation District’s Eagle P3 commuter rail line to Denver International Airport; the monetization of the Chicago Skyway and Indiana Toll Road; and the East End Crossing of the Louisville-Southern Indiana Ohio River Bridges Project. Later in the afternoon, panelists discussed challenges and opportunities of P3’s, including navigating complex bureaucracies, keeping projects transparent, and winning public opinion when many Americans remain skeptical of the agreements. 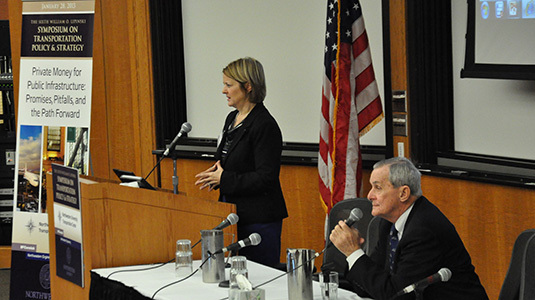 The fifth annual William O. Lipinski Symposium on Transportation Policy brought more than a dozen reputable speakers and hundreds of attendees to Northwestern’s James L. Allen Center on November 14. The symposium was sponsored by the Infrastructure Technology Institute, a federally funded transportation research center at Northwestern. The Institute develops advanced methods for monitoring infrastructure condition and performance to assist owners and operators with critical decisions concerning structural integrity, renewal, and rehabilitation. In the symposium’s opening remarks, U.S. Department of Transportation Secretary Ray LaHood acknowledged that the United States is still in the planning phase of high-speed rail, unsure of where the tracks will go or how they will connect. That uncertainty is reminiscent of another enormous project that inevitably rewrote our nation’s history: President Dwight D. Eisenhower’s 1956 creation of a nationwide interstate system. Former U.S. Secretary of Transportation and White House Chief of Staff Samuel K. Skinner received the David F. Schulz Award for Outstanding Public Service in Transportation and Infrastructure Policy from Northwestern University on Monday, Nov. 8. 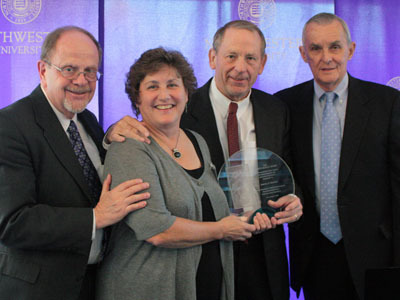 The honor was presented as part of the fourth annual William O. Lipinski Symposium on Transportation Policy. The symposium, “Public Transit for Chicago: A Sustainable Ride to the Future,” was held at the James L. Allen Center, 2169 Campus Drive, Evanston campus. Transportation leaders and policy makers from across the country addressed the public transportation challenges and opportunities facing the nation and Chicago. Technologies and financing for the future were discussed. Northwestern’s Infrastructure Technology Institute (ITI) was the event’s sponsor. 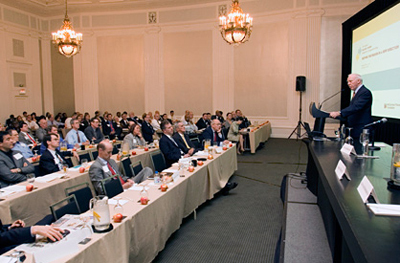 The 2009 symposium addressed issues and opportunities in freight transportation for the Chicago region. Chicago has been, and remains, the freight hub to the nation. This began with the natural connection between Lake Michigan and the Mississippi River first utilized more than 300 years ago. The centrality of Chicago in the nation’s freight system was secured with the advent of the railroads in the 19th century. Today, the confluence of Interstate highways, and the national dominance of O’Hare Airport keep Chicago the nation’s freight center. This pre-eminence of Chicago as a freight hub brings the region a high level of national and international connectivity for goods movement, supporting local industries, markets, and jobs. At the same time, this role brings challenges, in the form of congestion on all modes, delays as freight is interchanged among railroads and between rail and truck, and consequent problems of safety and air pollution. 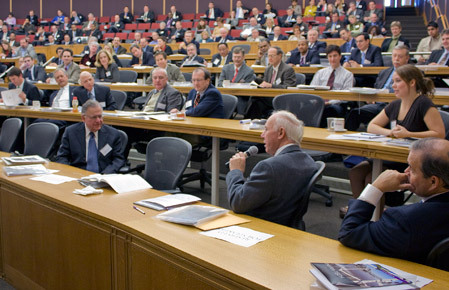 Participants in the 2009 Symposium heard perspectives on the freight challenges and opportunities facing Chicago and the nation presented by leaders in government, industry, and academia. They had the opportunity to discuss achievements and consider action priorities to make freight flows to and through Chicago more efficient, sustainable, and environmentally sound. 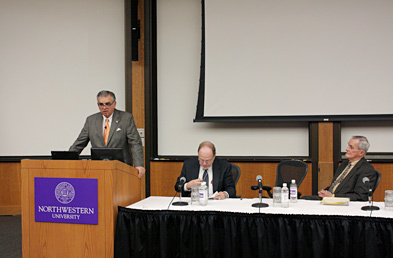 On November 13th, 2008, policy makers, transportation professionals, faculty, and students assembled at Northwestern for the Second Annual William O. Lipinski Symposium on Transportation Policy. The Symposium brings together transportation leaders to discuss innovative approaches for planning, financing, and constructing transportation infrastructure. Using the 100th anniversary of Daniel H. Burnham’s 1909 Plan of Chicago as a vantage point, speakers and participants at the Symposium envisioned a future transportation system for the Chicago region to meet the accessibility, capacity, quality, and sustainability needs of our society and economy for the next century. The series of presentations and panel discussions identified current challenges facing transportation systems locally and nationally and explored avenues for change. Former Representative Bill Lipinski opened the forum named in his honor. The first panel of experts delineated the important accessibility and mobility issues affecting the vitality and prosperity of the Chicago region and the nation. A second panel of speakers offered feasible approaches to financing and managing transportation systems and illustrated successful systems through examples from around the world. U.S. Rep. James Oberstar (D-Minn.) gave an inspirational keynote address, calling for action from all levels of government to attend to our deteriorating transportation infrastructure. 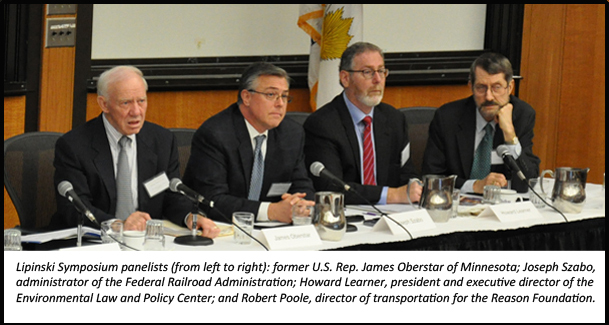 In the afternoon, a third panel of speakers discussed cutting-edge policy and technical tools to improve the performance of regional transportation systems. The final panel of local speakers commented on recent challenges to pass legislation for a robust and dependable transport network and entertained a dynamic question-and-answer session with forum attendees.